opa 627bp in MHZS cd33 - 解碼/訊源DIY - HiFi Fever - Powered by Discuz! I have a question of my upgrade it for replacing of outup caps from SCR 0.22uf/630v to Jensen al oil cap 0.22uf/630v. opa 2604 changed to opa 627bp. Result is very good. But i found that the working voltage of IC is 28.9v so the 627bp is 18v so it is quite hot. It played around 0ne hour, no problem was found just quit hot. I also check the IC data of 627bp working max voltage is 18v. Is it ok for that cd???????????????????????? be save now I change IC from opa2604 to opa2132 much impovement, it save, no heat found, because the max voltage of opa2132 is 35v. opa2604 max voltage is 25v. So suggest member who have MHZS cd33 or cd66 to change the IC must becare. • MHZS 66E - is it grounded? I ready a pair auricap, JENSEN silver 單支線 (for main board to RCA 座). 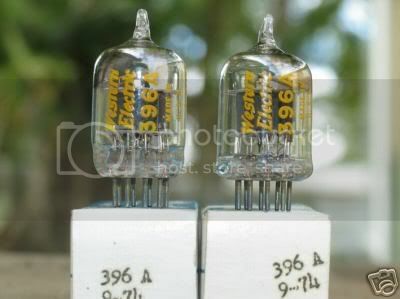 i have changed tube to GE5670w old stock (new) ,changed digtal outup from RCA to BNC style and also chenged solen cap to ERO MKP 1852 0.22uf/1000v blue colour. 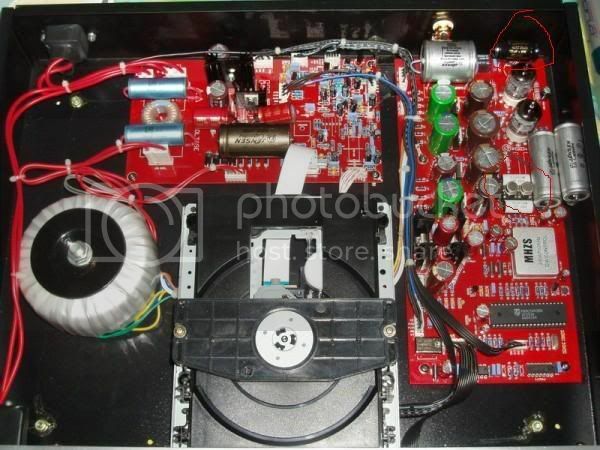 Just get this CD player, will like to change the tube first, anyone have try this WE396A before? Compare to GE5670 which one sound better? I have no expreience on tube 369A, but some reports said that is the best tube . But this is around HK$350 each. GE5670 just $110 both. Thia is very good lor!!!!!!!!! Can you give the feeling of listen for 386a to me. 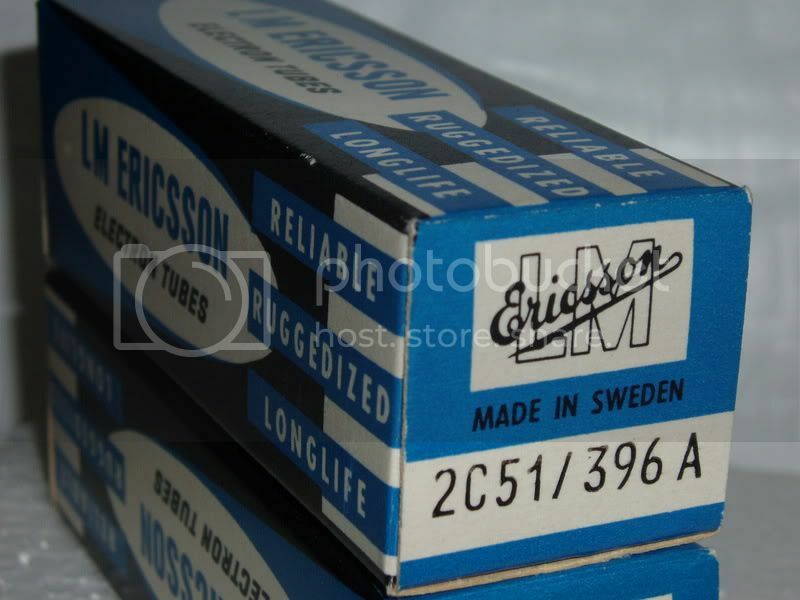 i have found 1 more tube, the shop said is better than WE396A is ERICSSON 396A, made in sweden, price is lower than WE396A..... you heard about this tube? i dont know should try this or not..... :? i want to change my CAP too, what is ERO MKP 1852 cap? from what manufacture? i heard of alot of review said change to silver/ oil or silver cap have more brighter sound but will softer the bass n midbass, so what should i change? any CAP that can have all even sound? I also replaced the 4 rubycon caps before Elna to Nichcion (Muse) 4,700uf/25v Real product not china product (Green with bule cloue words.) buy it in 凱韻 (油麻地) HK$25 each. do you know what is the function of the 0.33uf M-cap(white in colour)? Hi, this tube look gorgeous :shock: ,if you cant find in hong kong, can go ebay n seach. What's the price of the ericsson 396A? 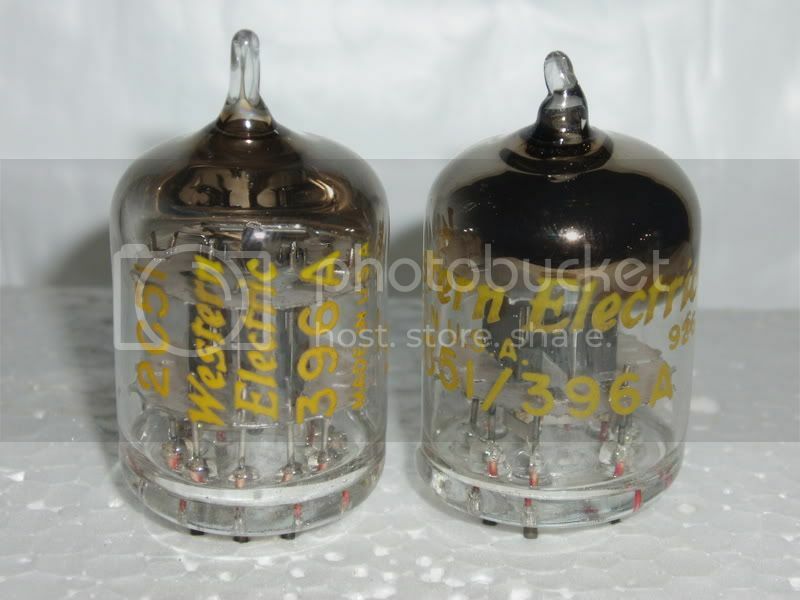 I brough some WESTERN ELECTIRC 396A from ebay also......bcoz cheap. I want to share something to you, i have change my power coupling cap to Mundorf ZN cap, n also the tube coupling cap to Mundorf Silver/oil. Pure silver cable 0.33mm from PCB to RCA. Ofcause the most important is change the tube, my is ERICSSON 396A. Many many thanks for DUALXEON advice on modification, unfortunated i cant come over to http://vocativeaudio.com/. i'm actually from Malaysia......... : : : :wink: Sorry. I have upgrade my mhzs cd33 as follow photos. At first i want to change my Tube Coupling CAP to AudioNote Copper oil 0.22uf, i know this cap really sound good, but have 1 problem, cap spoilt, according to my diy shop here. so i choose Mundorf silver/oil. log in to http://www.photobucket.com/. register first, is free. after that wait for email notification,using email to activate you account then only can up load your photo, anysize photo, this photo bucket will adjust the correct size for you, dont worry. :wink: let me know if need help. 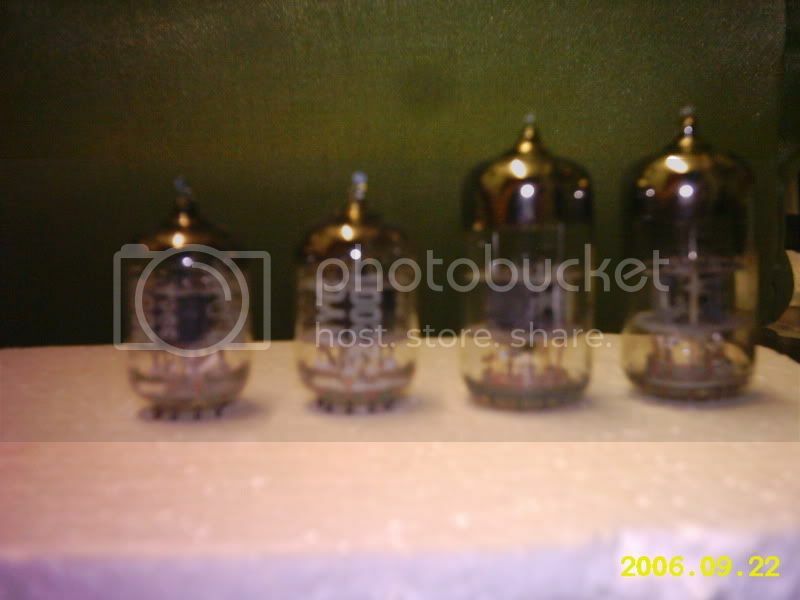 i need to verify my last post on the ERICSSON tube VS Western Electric tube. at first i try my WE, sound sweet, easy to accept that kind of MUSIC. the Vocal part is like 3D n also some of intrument too. my upgraded Mhzs cd 33's photos as follow for sharing. The sound great than CD66 much. can i know what is marked with red ink? what value? thanks! IC is opa627am the white cap value is 0.1uf/630v UCC cap (Taiwan). ths sound better than wimma box just $9.00 each in this web site. 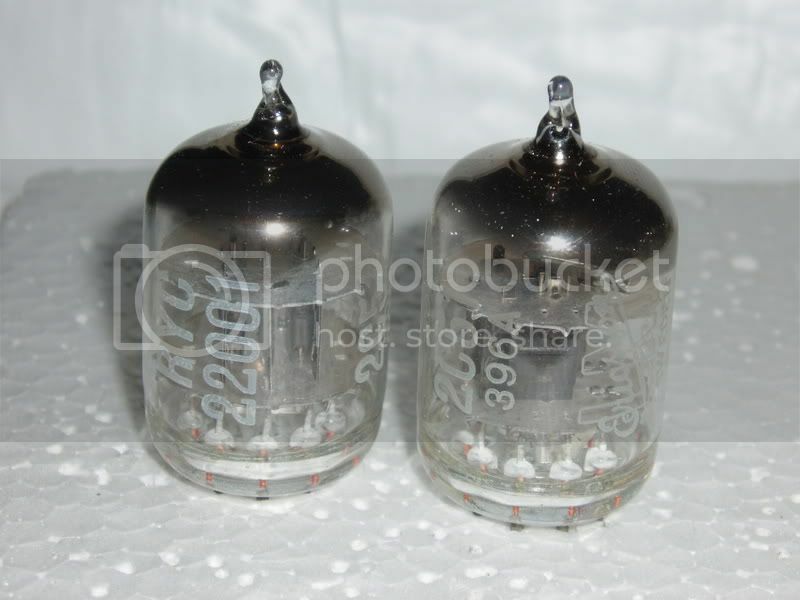 the function is filter caps for OPA627am. Can maked the sound body shap. The cap at the back is Jensen cap of 100uf/150v. May i know which part of Malaysia u are in? KL/PJ? I'm new in DIY, I'm from malaysia too, may i know which shop in Malaysia u always get your part/component? Did you compare the GE 5670 with your 396A is it a lot of differences or just slight different? Where can i get the GE 5670 in Malaysia? what's the price? Great to have friend from Malaysia. i'm from KL, work in PJ. i also new in DIY. In Malaysia only have 2 DIY shop :cry: , the most stock is OCTAVE PJ, another 1 is DIYPARADISE Kuchai lama(part time). not much choose here, the shop that is selling GE5670 is DIYparadise RM45/pc. but i prefer WE396A(my opinion). 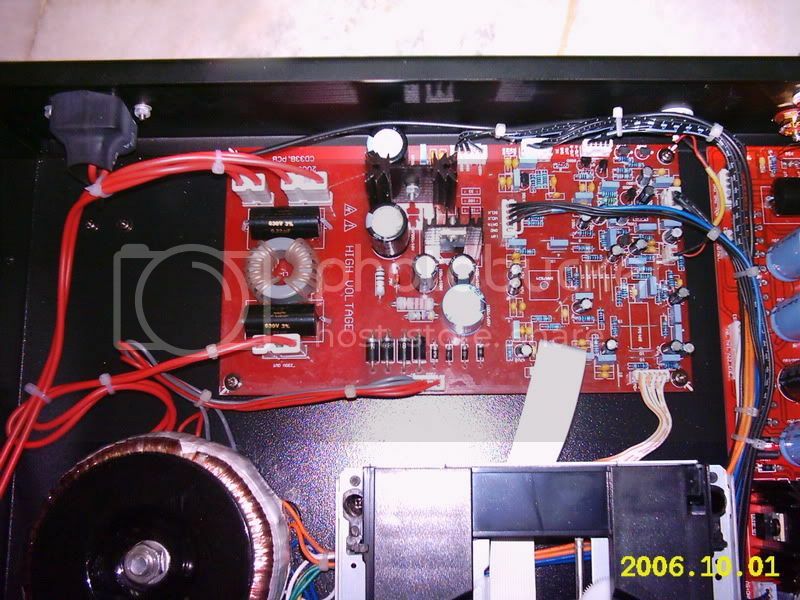 you want to put GE5670 to your CD player? what CD player you are using? i did't compare the GE5670 with WE396A, but if you have we can try it out :wink: . different tube have different sound characteristic, is up to individual to discover it, hope can share MUSIC with you. can i change this to black gate NH 100uf 160V or Black Gate FK 100uf 100V? any different with Jensen? If changed to black gate, the sound will be HI FI sound than Jensen. Jensen cap can provide muscial sound. up to you to use. 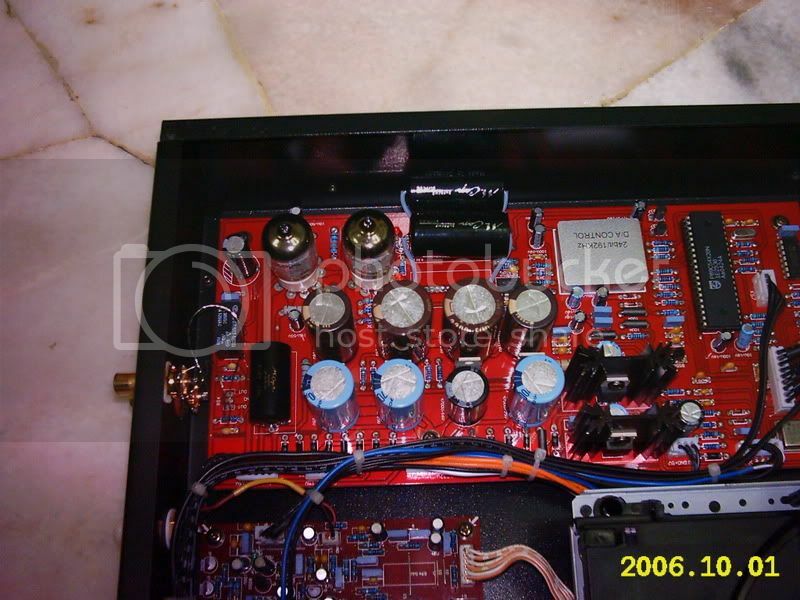 I'm using BADA HD-21 single tube player. If not mistaken, follow electronics theory it is safer to us cap with voltage tolerance equal or larger than the original to avoid burst right? Since Jensen is 100uF,150V we shall use us ecap with 100uF, &gt;= 150V right? the original ecap is 100uf/100v. So use ecap &gt;or =100v is ok. I will wait for hearing from you. A much different when dio it. You can buy the jensen cap from William. Do you know any sound different on this cap if change to other? is this cap function to supply voltage to the tube? or other function? This cap is supply power for tubes, so very import for sound quality. When i changed it from M-cap, the sound become detail, smooth and powerful and very balance, win too much. M-cap's sound just clear only. I also found that have broken at the bottom of M-caps and other solen caps also. Because they to close the pcb broad, it were burn by the solder with the worker. So i remind all MHZS's cdp owner of this. 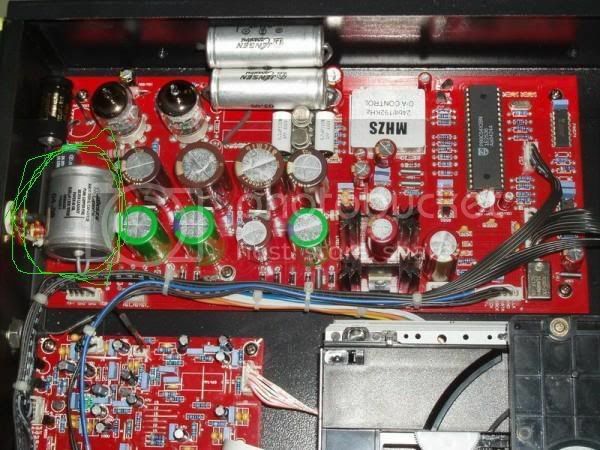 How about the 2 silver cap on top of the picture superwhite show you (very near to the tube)? what's their function/purpose? Is it supply power to the tube as well? Which cap play more role in sound quality? the cap superwhite circle or the 2 caps near the tube? The two caps in front of the tubes as a filter of opa 2604's outup, so affect of the sound two much. both are important, if change boths, that the sound will be closed to prefect. Have you upgraded you cdp also? GMT+8, 2019-4-20 16:45 , Processed in 0.056679 second(s), 25 queries , Gzip On.